October 15 marks International Day of Rural Women. 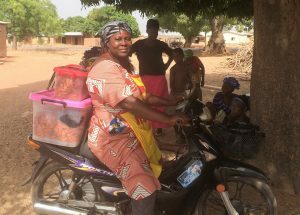 While people's experiences vary both between and within countries, A4NH researchers pay consistent attention to the experiences of rural women, recognizing that gender, equity, and empowerment cut across borders. Lessons learned in one place may inform those making decisions in another. Much of this learning, from A4NH researchers, partners, and others working in this area, is documented on the Gender Nutrition Idea Exchange (GNIE), a blog hosted by A4NH. "When I think about women in rural areas around the world, there is no one story," noted Hazel Malapit, A4NH's Gender Research Coordinator. "Their circumstances, their experience, their lived realities are diverse. To better understand the connection between these women's livelihoods, their own health and nutrition, and their children's and families' health and nutrition, we need to hear their stories told in different ways." Recently on GNIE, the Feed the Future Soybean Innovation Lab's Socioeconomic and Gender Equity Research team used IFPRI's Women's Empowerment in Agriculture Index to understand the gendered constraints faced by soybean farmers in northern Ghana, such as unequal plot allotment and restrictive gender roles that keep female farmers from participating in soybean markets. In doing so, they consider how much women are involved in decisions on credit, control over income, and other matters that are critical to women's empowerment. Elsewhere, Jessica Raneri of A4NH Managing Partner Bioversity International and colleagues shared experiences in northern Vietnam with using vignettes, or imagination exercises, to understand communities' social norms, which play a central role in shaping household food allocation decisions. Information gained from these studies will help researchers determine which nutrition interventions might have the most impact. Rural women's experiences are not limited to the farm or the household, however. Kristina Roesel of the International Livestock Research Institute, another A4NH Managing Partner, considered gender roles in sub-Saharan Africa's many and diverse informal markets, where food safety demands are growing, particularly for animal sourced foods. Women play critical roles throughout the value chains in these markets, which come with particular health and nutrition impacts. Beyond the market, access to animal sourced foods can provide women and their children with nutritional benefits, along with increased security and status within the household. 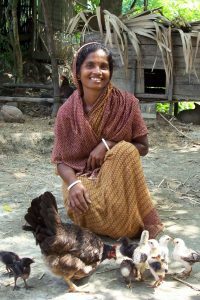 Researchers from the University of Sydney shared insights on how control over chicken production can positively impact women's household status in Timor Leste. Migration receives a lot of attention in development work, but often it is focused on those migrating. Researchers at the Friedman School of Nutrition Science and Policy at Tufts University recently blogged on GNIE about the impacts on those left behind — often women, who find themselves taking on different roles, and struggling with unexpected impacts on nutrition, security, and household decision making. Experiences of those in Far West Nepal can help others understand what women in other out-migration situations might be facing. "In research done by A4NH and by others who have shared on the Gender Nutrition Idea Exchange, we sometimes see commonalities across different places, or between different groups of women," Malapit remarked. "Sometimes we see important differences where we can learn something new about aspects of women's lives we have never head before. Sharing this information allows us to build on one another's work, and make greater progress toward our goals of improving nutrition and health for everyone."